Composers and musicians will be familiar with the experience of hearing a song “in their head,” imagining how that piece of music might go when there is no music playing in the room. These creators are not alone, and most people have had the experience of having a song stuck in their head, sometimes with incredible accuracy. Not only the vocal melody but the entire piece of music may be “heard” in the mind, complete with instruments, timbres, and even the recording quality of the piece that sticks in the memory. Sometimes a tune gets stuck in your head for so long that it almost seems like you can hear the music coming from somewhere else. Although these experiences are quite common, a slightly different condition can be quite common: musical ear syndrome. Rather than hearing music that you know exists only inside your head, those with musical ear syndrome actually believe that the music is external to themselves. Sometimes that music sounds like it’s coming from a neighbor’s house. In other instances, those with musical ear syndrome think the music is coming from a car parked outside the house. In one of the more extreme cases, a person took action, banging on the wall to make a neighbor turn down music that didn’t exist. The effects on social relationships in a shared living space can become incredibly strained when one person believes that music is being played at a loud level and another knows the music is not real. Although this syndrome might seem delusional, it is in fact a non-psychiatric condition. The person with the condition experiences the neural phenomenon of sound, simply without an external stimulus to bring it about. Though other hallucinations can be linked to substances or to legitimate psychiatric problems, those with musical ear syndrome most often have hearing loss. The experience of hearing loss can be a slippery slope leading down the path of mistaken sound, including musical ear syndrome. When a person with musical ear syndrome is given an electroencephalography EEG test, clinicians can witness the very parts of the brain responsible for understanding music and language lighting up as if they had been stimulated by external sound. You might wonder what might cause such a troubling syndrome. Some suspect that the person with the syndrome is hypersensitive to sensory stimuli through the auditory nerve. When the person also experiences hearing loss, that hypersensitive auditory cortex becomes deprived and starts to make up phantom sounds. Medications can also cause this puzzling condition. Many mood-altering medications can have the effect, as well as allergy medications such as Zyrtec and Claritin. 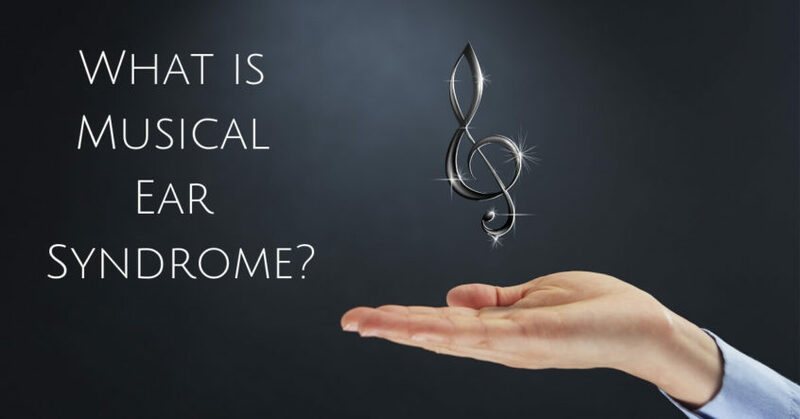 Some who have musical ear syndrome also report that the music occurs only in conjunction with certain household sounds such as radiators, air conditioning fans, or refrigerator motors. One confounding factor, of course, is stress. As with so many other health conditions, stress can exacerbate an otherwise manageable situation. Musical ear syndrome is no different, and stress management techniques can be incredibly effective against the challenges posed by phantom sound and musical hallucinations. The experience of musical ear syndrome is incredibly similar to tinnitus, which is the sensation of ringing in the ears or whirring or buzzing noise. And, just like tinnitus, hearing aids can be of assistance in the condition of musical ear syndrome. In the case of tinnitus, hearing aids can be used to cancel out the pitch of the ringing in the ears. However, in the case of musical ear syndrome it would be impossible to cancel out the complex music that comes to mind. Instead, hearing aids introduce real auditory stimuli that the brain can process. Those sounds, including a television or actual music played on the radio or other device, can provide the stimuli that the hypersensitive auditory cortex needs to stay occupied. From another angle, playing loud sounds can distract the mind from creating musical hallucinations, essentially drowning out the phantom sounds. If you’ve noticed changes in your hearing abilities, don’t hesitate to contact us at Hearing Aid Associates. We provide hearing tests and hearing aid fittings to ensure that you are hearing at your best!